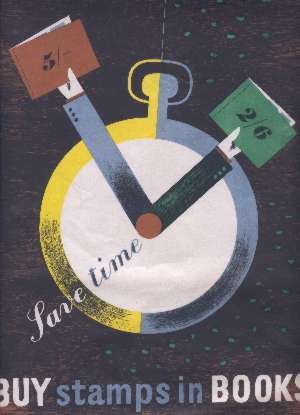 In 1846 the Post Office was at Mr. H. Taylor's grocery shop, with mail arriving at 9:30 am. and departing at 4:00 pm. The Post Office has been in the present building since c. 1855. On a map of the village dated 1761 the property is shown as a drapers. The map also shows that there were many more shops and public houses than exist today. In 1992, when Paul and Liz Downing bought the premises from Daphne and Michael Spencer, the first thing they decided to do was to completely refurbish the interior of the shop and change the location of the post office from left side to right side. This created a great deal of interest in the village, and on the first day of opening there was a long line of villagers waiting to see what it looked like. During the renovation work a number of very interesting artifacts came to light, trapped behind counters which had not moved in more than a century. Paul and Liz have carefully preserved these treasures from Winster's past, and it is now possible for you to view them on this web site. 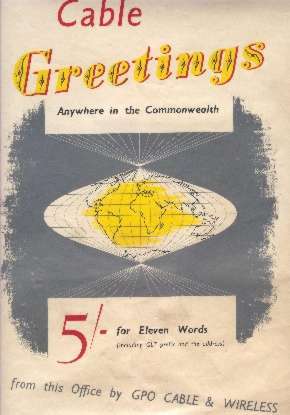 The first interesting item which came to light was a letter addressed to Mr. H. C. Heathcote, Chemist. 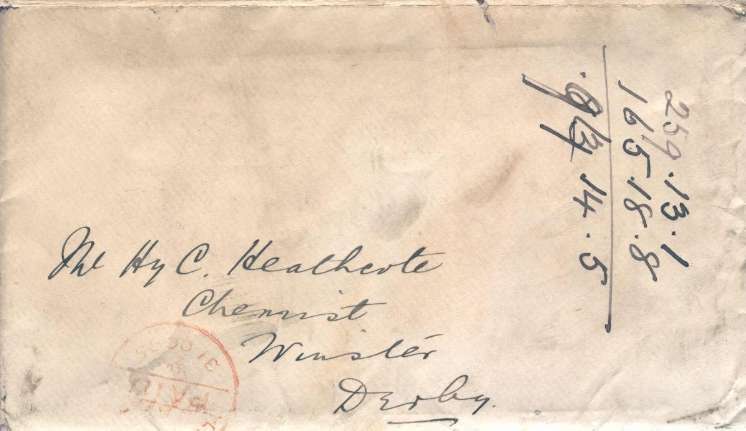 On the front of the envelope is a date stamp for 30 October, 1895, and some monetary calculation in pounds, shillings and pence. 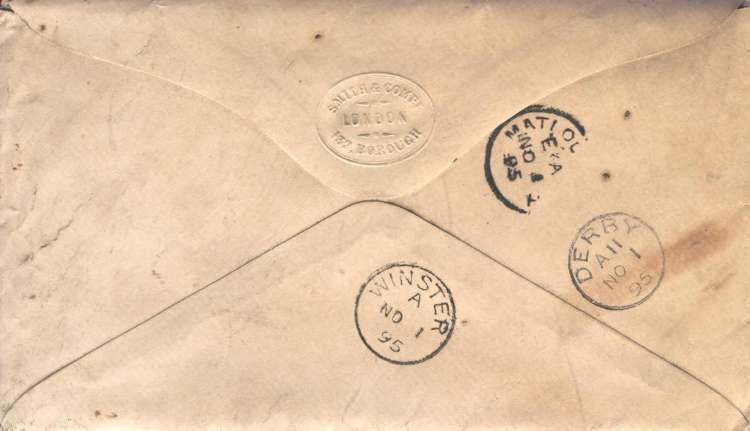 On the reverse side are a series of date stamps for November 1st, 1895 and the embossed seal of the senders, in London. 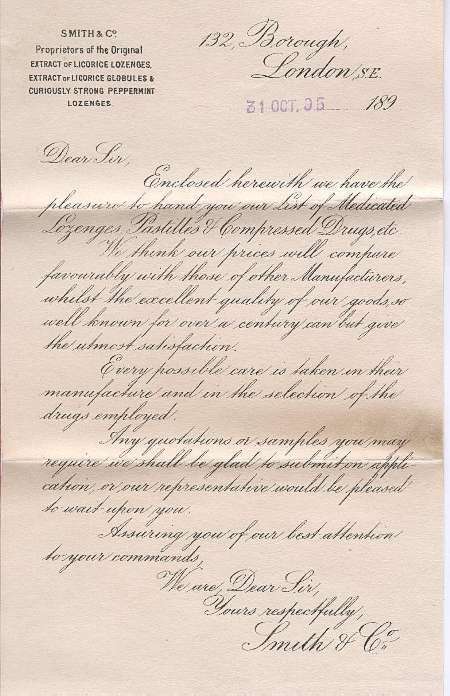 Inside the envelope was some paperwork extolling the virtues of their company's lozenges and other pastilles. 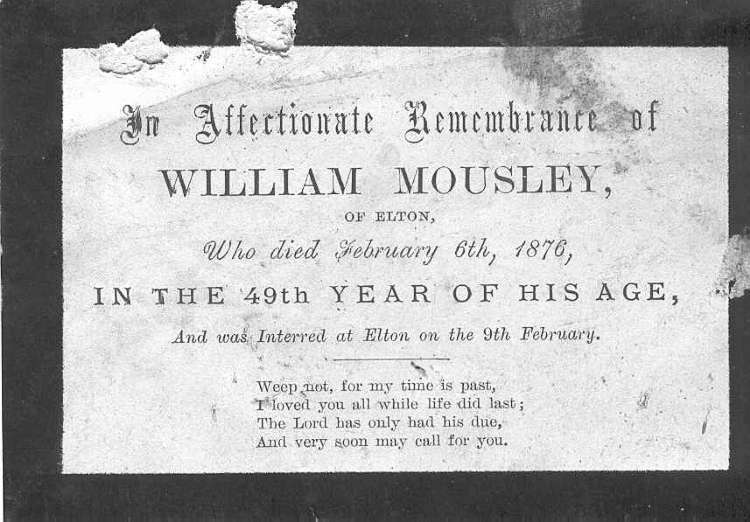 By far the most interesting item found was a little booklet, no more than 2 inches tall, inside the front cover of which someone had written "5feet 8inches, 12 Stone 10lb, 178 pounds, G.H.M, 18th January, 1802" (although it's difficult deciding whether the 0 should be an 8, making it 1882). 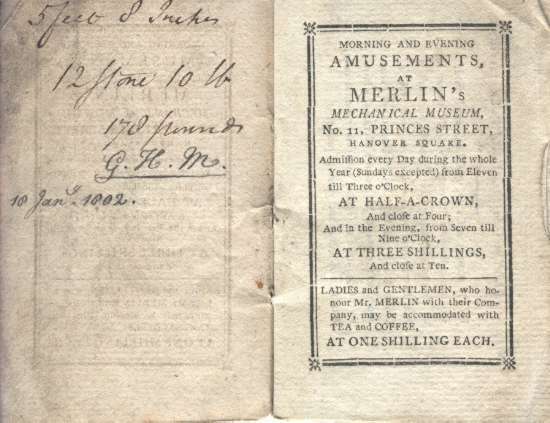 The book is all about "Mr. Merlin's Exhibition" and is written in really olde English. 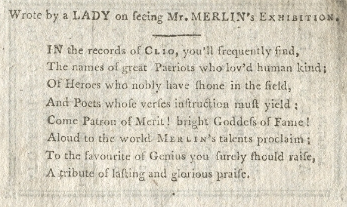 I particularly like the verse on page 2, written by a lady, as the attached text would have us believe. All 17 pages of the book are available to those who are interested.